Minhee (Sun Mee Chomet) and Junhee (Audrey Park) are two sisters living in North Korea. Older sister Mihnee has lost her husband, her son, and her health, and younger sister Juhnee tries to get them out of the country. When Minhee falls into a well at the border, Juhnee continues to America, determined to come back for her sister when she is able. From there the narrative splits. We see Juhnee forging a life for herself in New York City, working as a nurse, interacting with a wide variety of women (all played by Sara Richardson to comedic effect), and tentatively making a friend (JuCoby Johnson, who runs the risk of being typecast as the sweet boyfriend because he does it so well). Back in the well, Minhee finds herself in a dream world where she's searching for her son and imagining what happened to her husband (Kurt Kwan, who also adeptly plays all the other roles in Minhee's dream world). This is where the absurdity comes in (there's a bear in a beret and musical rice), as you're not always sure what's happening or where we are. Which seems quite apropos for a story about North Korea. Sun Mee Chomet and Audrey Park beautifully portray the sister relationship that is at the heart of this play, caring for each other, sacrificing for each other. Though separated by thousand of miles, the sisters are never far from each others' minds as they strive to be reunited with the only family they have left. I desperately wanted them to be together, happy and safe in America. But alas, this is not a happy ending kind of play. 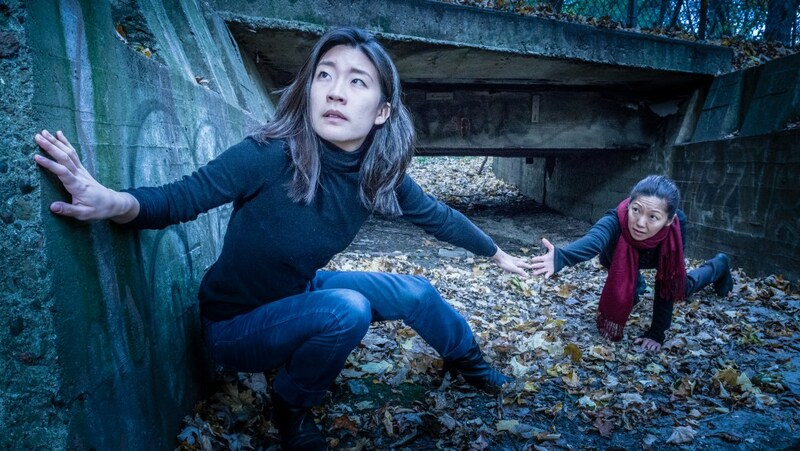 In addition to seamlessly mixing the realism of NYC with the surrealism of the dream world, playwright Mia Chung has also cleverly depicted what it's like for someone to learn a new language through total immersion. 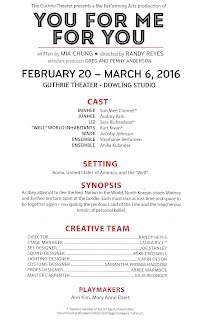 When Juhnee first leaves North Korea, the Americans she encounter speak in gibberish (delivered with utter conviction by Sara). As she progresses in her language skills, the English she hears slowly becomes more clear with a few works making sense, then most words making sense, and finally, it's clearly understandable English. It's an ingenious way to invite the audience inside the life of an immigrant. Also ingenious is Joe Stanley's set design. What looks like a simple abstract boxy set actually has many compartments that open to reveal colorful backdrops or set pieces. All of the NYC action takes place on the upper level of the set, while the North Korea and dream worlds occur on the floor in front of the audience, clearly delineating the setting. So it turns out You for You for Me isn't just an idiotic thing that Randy Jackson said. It also refers to sacrificing yourself for the good of those you love. 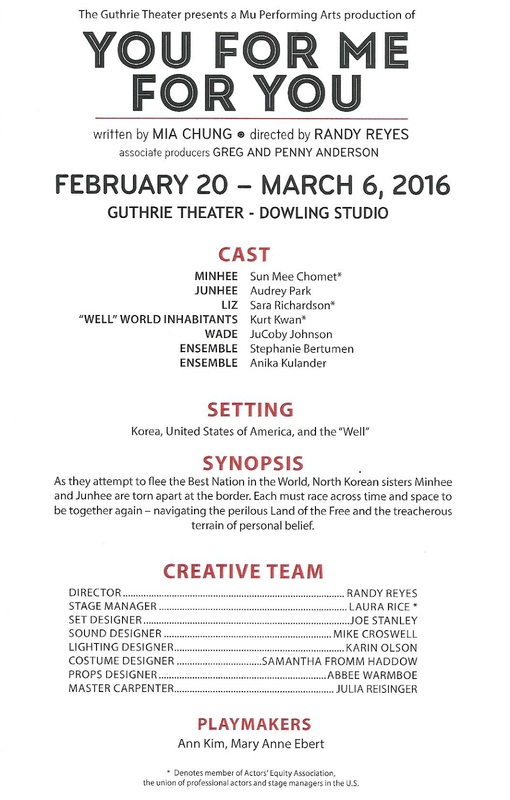 This play provides us with a peek into a mysterious and little understood place through the lens of a very human story (playing now through March 6 in the Guthrie's Dowling Studio; for more information on North Korea visit Mu's website or the website Liberty in North Korea).